Lately we’ve wanted to write a post about “simple living” because it’s our living situation over the next few months. 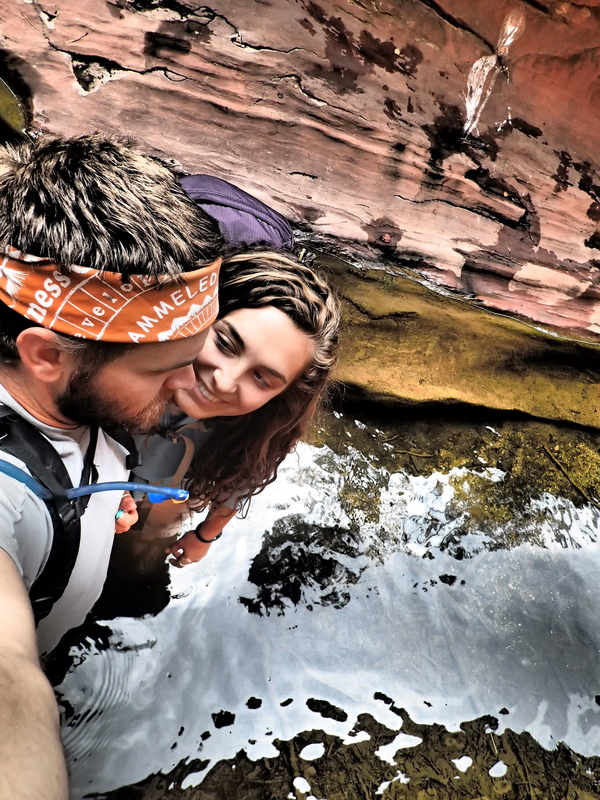 We both love the feeling you have when you’re backpacking. You’re free from all the “stuff” that you own in your daily life. The smallest things make you happy, you don’t take moments for granted, and you seem to focus inward, as well as appreciating your outward surroundings. You feel light and surprisingly satisfied. Of course the irony in backpacking is that to be so simple you spend a ridiculous amount of money and put in a massive amount of time and effort. When I first tried to write this post I only focused on the simplicity of our gear. It was a flop. After I had described my failure of a blog post to him, Kyle pointed out that simplicity wasn’t only a state of being, but also a state of mind. That we were choosing to mentally simplify our lives, to remove complexities like jobs, media, societal stressors, transportation, what to eat for dinner… but then he got worried, in stating this, because aren’t we also “simple life” frauds? We are still going to have a camera, iPhone, credit cards, we are planning on filming ourselves, and damnit, we have this blog! But then I pointed out that while much of what we are carrying has clear connections to the modern world it all also has a purpose in our lives on the trail. So then the idea of intentionality came into play (including whether intentionality was actually a word and how many times I could fit it into a sentence). How does being intentional relate to simplifying ones life? In our situation one of the exciting things about backpacking is that everything you have has a purpose, everything is chosen with intention. That is one of the reasons backpacking feels so great and so liberating… but can you live your every day life that way? Then we voiced one of our greatest fears… what happens when we come back? How do we keep our lives simple when we have an apartment and we want to fill it with things? Where does design and aesthetic meet simple? Kyle was quick to point out that that is exactly what modern architecture is all about (typical). So in our daily lives do we just strive to ensure that everything we own has a purpose and that we chose it with intention? Why is simple, in our eyes, suddenly better then complex? What does simple even mean? Where else to turn but good old dictionary.com! Their definition of simple didn’t really resonate with us or describe our adventure. Simple was defined as one ingredient, modest, not ostentatious, not sophisticated, easily understood. If you have ever heard a bunch of gear heads talk about their gear you would understand why “not ostentatious” and “modest” doesn’t really fit, “not sophisticated” doesn’t work because a lot of our gear has been refined and redesigned to give it the highest level of sophistication possible, and I can guarantee you, it was not easy to understand how to set up our tent, even with directions. The words simplicity and simplify were much more poignant. Reduce to basic essentials, diminish in complexity, clarify. We especially liked the idea that simplifying equaled clarifying. That was how we felt when we were backpacking, as if everything was clearer. When you have so little it really helps you to realize what is actually important. We started to talk about how accumulating stuff could cloud your vision. You become attached to it, spreading your energy thin between all your things. Its almost as if, we postulated, your life gets watered down with too many things. Its not as pure or intense as it once was. Now the term “simple living” has so much more meaning for me. It is no longer about our gear being light and thus, we have simplified things. It is also about choices. The choice to simplify what my life is about for six months and just walk. The simple motion of putting one foot in front of the other for mile after mile will be my only concern. But of course it’s never that simple, there will be missteps and the unexpected. If there weren’t, this blog wouldn’t be very exciting. What I am realizing is that even if our intentions are simple our lives will always be complex. Simple things make us smile.. Dig the quote and the thoughts. Keep on keeping on! When you get on the trail and put in your 20 plus miles for the day, you won’t be worried about “simple”. It will all become crystal clear: all you will want to do is sit down, drop that pack, eat, get in that sleeping bag and go to sleep. That is my deffinition of “Simple”. It is human nature to try and distill even the most daunting tasks and biggest thoughts into simple, common, easily explained and understood bits. Don’t be fooled lest you befriend the Grizzly and become his lunch, nothing is simple about mother nature and the creatures. The challenge for all of our lives is balance! That’s why working toward predetermined, well thought through goals are important for us at any stge of life.